Posted June 28, 2011, 9:41 PM. A new scientific study, examining the fault structure of the southern San Andreas fault zone, has found that recent human regulation of the Colorado River may have delayed a major earthquake along the zone. There hasn't been a large earthquake under the Salton Sea for the past 300 years. Some details of the study are in a North County Times news article. The study has been published online in Nature Geoscience. The researchers are from UC San Diego. The study concludes that in the past, regular flooding of the Salton Sea area induced large earthquakes, occurring roughly every 180 years. 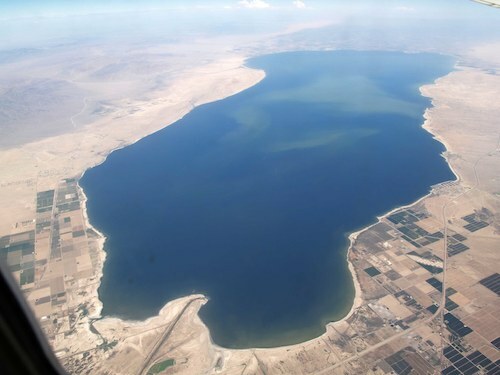 Another discovery is that the part of the fault that borders the Salton Sea contains strike-slip faults, which produced strong, directional shaking. A slip of this kind of fault could trigger propagation of an earthquake northward into Riverside and Los Angeles. The modern-day Salton Sea was formed in 1905.